Since 2003, the Rhode Island Animal Medical Center (RIAMC) has been focusing on the health and well-being of small animals. A full-service veterinary center, RIAMC will ensure your pet receives the highest quality care through state of the art equipment and administrative tools. Our team of friendly and professional veterinarians, veterinary technicians, and support staff strive to make each visit efficient, affordable, and pleasant. Our dedicated and friendly team of pet care professionals provide comprehensive care for dogs, cats, and other small animals. Our facility is equipped with the latest tools and technology to keep your pet healthy and happy. We have a spacious lobby, two waiting areas with television and retail shopping filled with everything your pal needs and wants. We are equipped to handle all common medical concerns, in addition to more serious conditions. Our modern exam rooms, diagnostic lab, digital radiology and surgical suites allow for the quick diagnosis, treatment and monitoring of patients. Wellness Plans are available to make it easier and more affordable to keep your pet healthy and happy. These plans include examinations, testing and vaccinations, and also provides discounts on services, products and medications. Professional grooming services make your pet look and feel great and is also a great opportunity to detect potential medical problems that often go undetected by busy owners; these conditions can include irritations of the skin, eyes, ears, mouth, paws and nails. In addition, difficult or special needs animals are no problem for us – our groomers are very knowledgeable about the breeds and medical conditions that can cause high anxiety and how to handle them. If needed, anesthetized grooming can be performed, under the supervision of a veterinarian. Doggy daycare at Four Paws Pet Resort provides plenty of companionship, treats, and active play, whether you pal needs a day of play or a set weekly schedule. All guests are fully supervised by our well-trained staff and enjoy as much outdoor time as possible in our safe and secure 5,000 square foot enclosure. Daycare will help your buddy stay fit and reduce bad behavior, such as chewing on furniture or ripping up the trash – all signs of loneliness and frustration. It’s a great way to socialize a new puppy and is particularly good for very active dogs. Pet boarding is available for long or short term stays. All guests enjoy clean and comfortable accomodations, as well as plenty of attention and TLC. As your pet matures from a puppy/kitten to an adult onto a senior, we offer comprehensive wellness strategies that will enable you and your furry friend to plan for each life stage and the unique health needs associated with each stage. A vital part of the exam is the discussion between the client and the professional care giver at RIAMC. The gradual onset of health problems in an apparently healthy pet often go unnoticed. Depending on the communication between you and your doctor an informed decision of a yearly or bi-yearly exam can be determined. Remember, your pet’s lifespan is shorter than ours. A lot can happen in 12 months. Rhode Island Animal Medical Center laboratory provides fast and accurate information so that your pet can receive appropriate treatment immediately after arriving at the hospital. When more sophisticated testing is required, we utilize a certified veterinary laboratory offering the expertise of board certified specialists in pathology, hematology, internal medicine and radiology. For your convenience we can also schedule in-house veterinary specialists in several different fields including internal medicine and cardiology. Dental disease, specifically periodontal disease, is the most common ailment affecting pet dogs and cats. At RIAMC, we feel it is very important that our clients realize the impact dental care can have on their pets overall health. No procedure is routine when it comes to surgery at RIAMC. Our team of doctors and surgical technicians provide an individualized anesthetic and pain management protocols for each pet undergoing surgery. For your pet’s safety, our operating suite is equipped with the latest in veterinary monitoring equipment including EKG, blood pressure, oxygen saturation, temperature, heart rate and respiration rate. We are able to perform most surgical procedures from spays and neuters to more complicated abdominal surgeries, mass removals and some orthopedic (bone and joint) procedures. We take pride in our equipment and our modern anesthesia and patient monitoring systems. Rhode Island Animal Medical Center carries an extensive inventory of veterinary pharmaceutical items, supplies, and medications. For the convenience of our clients we have the ability to treat your sick companions right away. We do honor requests for scripts but do not deal directly with any online pharmacies. You can depend on our well-trained staff to give your pal plenty of TLC, as well as the opportunity to socialize with other dogs in a safe and secure environment. Individual playtime, treats and group play are offered each day. 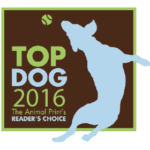 Dogs are supervised all day, whether outside in the dog park or in our specially-designated indoor play area. All dogs must be fully vaccinated and checked for proper disposition and like size. 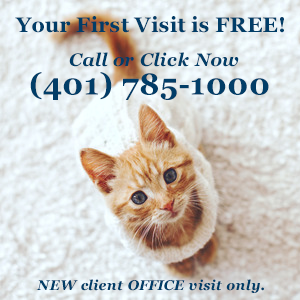 Please call (401) 785-1000 to schedule an appointment. We welcome personal visits so you can see the way in which we provide a happy and healthy stay for each guest. Creating a safe and comfortable stay for your pet is our highest priority. Our highly trained and experienced staff, and our clean, secure, and climate controlled facility produce a stable environment that you can depend on, regardless of the length of your pet’s stay. We offer a variety of accomodation and budget options, with clean bedding provided on-site. Originally from Arizona and attended UMASS as an undergraduate, Dr. Hart earned her DVM from St. Georges University. Dr. Hart lives with her son and dog in North Attleboro. Her hobbies are horseback riding, hiking and traveling with her son. Grooming pets at Rhode Island Animal Medical Center. A pet grooming professional for 20 years, Jody first developed a love for her profession as a student at Norfolk County Agricultural High School. Jody is proficient in all breed standards and pet trim including rabbits, ferrets guinea pigs, rats and hamsters. She has developed the skills to even groom some of the most difficult pets. She is also well trained in dealing with the sensitive issues of grooming geriatric animals. Grooming pets for almost 10 years with a passion for rescue dogs, Jeanette loves her job because it combines the two things she enjoys most – animals and art. When she grooms it is like a “living sculpture.” A 2008 graduate of the Rochester Institute for Dog Grooming in Rochester, NY, she enjoys grooming poodles, terriers and cats. She has two pugs, Stella and Seamus, 2 Persian cats, Cersi and Ezmerelda, and multiple tarantulas.